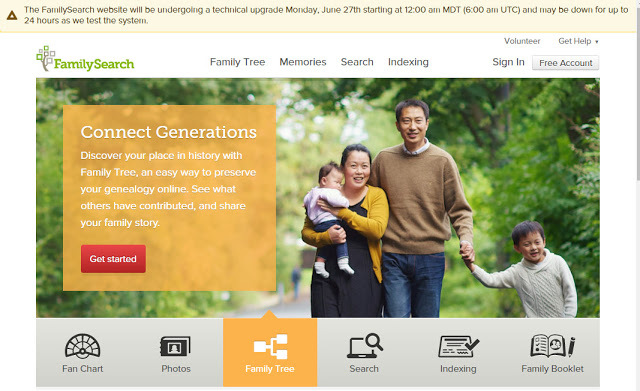 Just a reminder that the FamilySearch website will be down for a technical upgrade for some or all of Monday, June 27th starting at 12 midnight, Mountain time (2 a.m., EDT, 11 a.m. PDT, 0600 UTC). Why? Renee Zamora seems to have the most information about it - see her blog post FamilySearch Down for Technical Upgrade on Monday, June 27th 2016. "This is a major upgrade to the FamilySearch back end. Not only are they moving from an Oracle database to Cassandra, they are also moving to the Amazon servers. The connection to the (old) "new FamilySearch" website and its servers will be severed. This move will allow scalability. So instead of cruising on the highway at 55 MPH with occasional traffic jams, it will increase to 65 MPH with more lanes opening up as traffic increases. It's not going to be much faster, but the performance will be consistent. The bottle-neck on Sundays should be a thing of the past. "Moving to the new "Tree Foundation" is just that a foundation. Once that is in place the ability to build greater things into Family Tree become possible. Older issues can now be resolved, like merging IOUS (Individuals of Unusual Size)." If I read that correctly, this is for everything on FamilySearch, and especially the FamilySearch Family Tree. The FSFT link to new.FamilySearch will be severed and merges of duplicate profiles that were not possible will now be possible. We'll see! I hope it works flawlessly. I look forward to being able to combine duplicates for my more distant ancestral families. UPDATED: 8 a.m.: It was back up before 6 a.m. PDT and appears to work. Some duplicates in FamilySearch Family Tree cannot be merged.